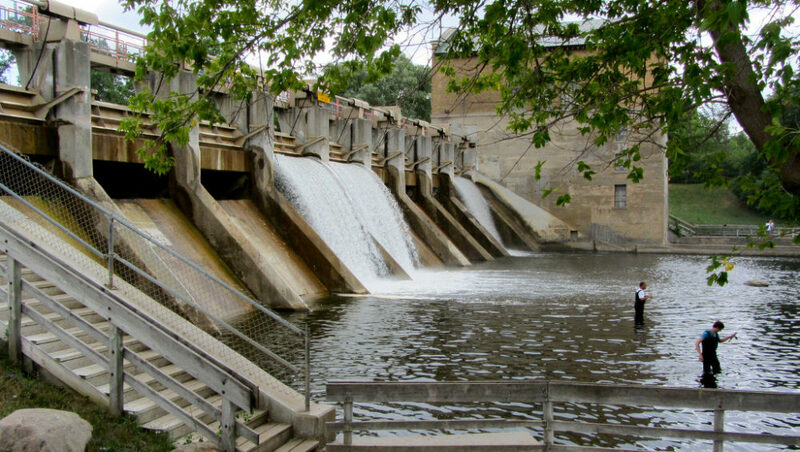 The Barton Dam near Ann Arbor is among the independent generation facilities that would be affected by new rate calculations in Michigan. On May 31, the Michigan Public Service Commission approved changes to the way avoided costs are determined under the federal Public Utility Regulatory Policies Act (PURPA) of 1978. Avoided costs are those that utilities pay independent power producers for their electricity that the utility would have otherwise had to pay itself. In Michigan, there are 45 facilities under contract with utilities, mostly landfill gas and hydro. The long-awaited changes to determining avoided costs, which are the first in roughly 25 years in Michigan, could provide protection to independent power producers who say they are at risk of shutting down. In a rate case involving Consumers Energy, producers feared their avoided costs would have been cut in half, making their plants not economically viable. Critics say Consumers’ goal in lowering avoided costs is rooted in the utility’s desire to build its own generation — and recoup the costs for that — going forward. This, in turn, would create less space for more distributed generation across the grid. “We thought it was a great decision and it showed the commission put a lot of thought into establishing the right avoided cost methodology,” said Margrethe Kearney, an attorney based in Michigan with the Environmental Law and Policy Center. Over the past year, Consumers Energy has been pushing for changes that set avoided costs near the Midcontinent Independent System Operator’s (MISO) wholesale power prices. Environmental groups and the Independent Power Producers Coalition of Michigan contested that this would have brought payments down to roughly 3-4 cents per kilowatt hour from roughly 7.5-8.5 cents currently. Both private and public renewable energy projects said they wouldn’t be able to operate at those prices. Kearney said there is a “sweet spot” for avoided costs that is not so low as to put independent producers out of business and not so high that utility customers are overcharged. While the case is ongoing and it’s still unclear what final avoided costs will be, Kearney believes the new methodology is a step in the right direction. “Assuming the right inputs are put in place, the methodology definitely hits that sweet spot,” she said. Several other utilities’ avoided cost rate cases — including DTE Energy’s — are also in line for changes, and the Consumers plan is expected to set the tone in how others will follow. Also, a new Michigan law passed in December requires regulators to revisit avoided costs at least every five years. In 1978, the PURPA law made it an obligation for utilities to enter into contracts with independent producers of cogeneration or renewable energy, if it is available. The Michigan Public Service Commission revisited avoided costs within the past two years as the first of long-term contracts between independent power producers and utilities were set to expire, and as the energy landscape now is vastly different than it was in the 1980s. Under the commission’s order, instead of using the costs of building a new coal plant as a baseline, avoided costs will now be based on combined cycle natural gas plants. Jester said in determining avoided costs, Consumers took the short-term view when wholesale power prices are all that matter. The longer-term view, he said, takes into account capacity requirements and operational costs that look ahead 20 to 30 years. “The Public Service Commission decided the latter,” he said, in making sure utilities did not discriminate against independent producers. The commission’s May 31 order also amends the “Standard Offer” tariff for independent producers by allowing larger projects (up to 2 megawatts instead of 100 kilowatts) to enter into contracts for up to 20 years instead of five. These are standardized contracts that don’t need protracted negotiations, which “lowers the transaction costs and benefits customers,” Kearney said. Though state regulators approved changes to the methodology behind avoided costs, the rate case is still open as the specific inputs that set avoided costs are determined. In that sense, independent power producers say it is still uncertain what the final price points will be. Taking together the details that still need to be ironed out over what utilities ultimately pay under contract, the essence of the 1978 federal law is that state regulators remain agnostic about what generation is built — and by whom — and that independent producers are not discriminated against, Chappelle said. Still, she believes the commission’s order is a step in the right direction. “Overall, we’re pleased,” said Chappelle, who formerly chaired the Michigan Public Service Commission. Jester said he’s optimistic about the final cost determinations, which could be decided by the end of July. While avoided cost contracts for projects less than 20 megawatts generally do not apply to large utility-scale wind projects, the declining cost of solar may open the market to those producers. Until now, contracts have been limited to hydro, biomass and landfill gas facilities. The PURPA law has paved the way for solar development in other states as costs decline, but utilities have taken similar tactics as Consumers to prevent that. Advocacy group Vote Solar says the avoided cost decision “bodes really well” for the sector in Michigan, said Becky Stanfield, the group’s senior director of western states. However, she said sector growth in Michigan will also be determined by how net metering rules are changed and how solar is valued in the Integrated Resource Planning process established under the state’s new energy laws. Kearney said the commission’s work on this issue to align with modern power markets positions Michigan as a leader in the region.